This is the second film I’ve reviewed in the Pleasant Surprises section, and it also happens to be the second film with a date in the title, the first being Star Trek (2009). I’ll try not to make a habit of that with every film in this section. I am so excited to talk about The Parent Trap (1998). I briefly mentioned it in my list of 10 Remakes That Are Better Than the Original Films, and I’m going to go into much more depth here. So let’s get moving on the double and talk about this exceptional film. I grew up watching a wide variety of films – everything from intense fare like The Fugitive to innocent entertainment like Sleeping Beauty. The Parent Trap (1961) wasn’t one of my favorite films. It was far too goofy for me to take it seriously and the adults were far too serious for me to relate to their problems in any depth. The camping part of the film seemed to stretch on way too long and the scenes of getting to know the families were equally tedious to slog through. 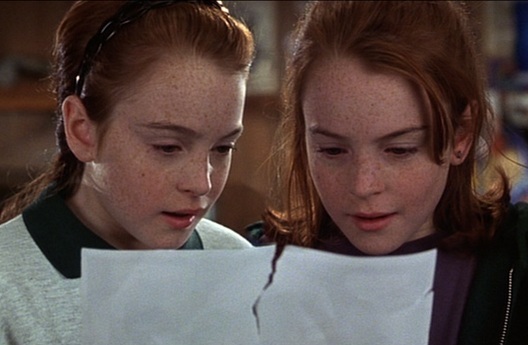 The original Parent Trap isn’t a bad movie, but it’s just mediocre in my book. When I heard about a modernized The Parent Trap in 1998, I had no hope for the remake. I was a teenager by then, and I thought it was too childish to be worthy of my attention. It also didn’t help that Disney was coming out with remake after remake (101 Dalmatians with Glenn Close, Flubber with Robin Williams), and all of them were absolutely dreadful retreads of the originals. Disney just didn’t seem to know when to leave well enough alone. I stayed away from the new Parent Trap until one evening when I was at college. It was 2005, so enough time had gone by that my attitude toward Disney films had mellowed a bit, and I was ready to give this one a try. It happened to be on ABC Family, and I didn’t have anything better to do, so I sat with my five roommates and watched this little film. I expected that we would all give up on it within the first half hour. I had no idea how much I was about to be delighted. 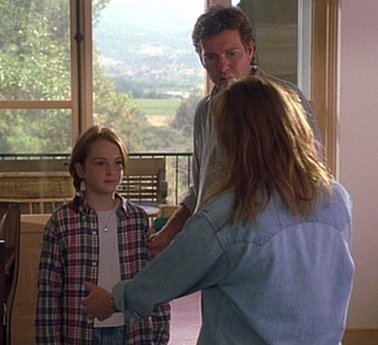 Everything about The Parent Trap (1998) works beautifully. The actors are perfect in their roles, the dialogue is snappy, the situations never feel forced, and there’s just an air of powerful emotion that permeates the whole thing. I loved it soon after it started. The biggest reason why this movie works so well is its director/co-screenwriter Nancy Meyer. She had quite a few good movies under her belt as a screenwriter, such as 1980’s Private Benjamin, 1987’s Baby Boom and, of course, the two Father of the Bride films from the 1990s. She was a perfect choice to update The Parent Trap because of her expertise in writing dramatic comedies. She put a lot of effort into every aspect of this film, and she succeeded in producing a remake that surpasses the original film in every way. Lindsay Lohan is a terrific actress. I’m just throwing that out there. She was able to carry the first half of this film almost entirely by herself before handing some of her duties off to the adult actors. And she did it all masterfully. I feel completely invested watching each twin’s plight trying to figure out who she is in relation to the other and then coming up with a brilliant plan to become a family again. She pulls off an English accent quite well and she’s equally charming and funny the whole way through. She did a much better job than Haley Mills. Even though Lohan has unfortunately fallen into substance abuse and other bad habits, her early film career will always stand as a testament to her many talents as an actress. 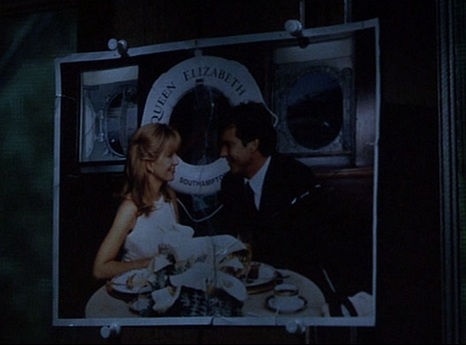 The whole film revolves around a single image: a photograph of the mother and father smiling at each other across a table. This photo was taken the night they met on the Queen Elizabeth cruise line, and it was torn in half when the couple separated. What a perfect metaphor. Each twin received one half of the photo. Hallie (who lives with her father in California) got the picture of her mom, and Annie (who lives with her mom in England) got the picture of her dad. When Hallie and Annie meet and start to put the pieces together about who they really are, they literally put the pieces of the photo together and everything else falls into place at that moment. The next time we see the photo it’s nailed together on the wall of their cabin above their bed. That’s the way the photo should be, and that’s how the people in the photo should be, as well: together! This movie then proceeds to give us several examples of two people who need each other to be truly whole: The twins’ parents come together in the end, of course. Martin (the mom’s butler) and Chessy (the dad’s sister/maid) fall in love the first time they see each other. The two sisters are happiest when they’re together. A dog can’t stand to be away from Hallie, but can’t stand Annie. By the way, wouldn’t that have been a great way to figure out which daughter is which at that pivotal moment in the story they won’t reveal their true identity? Just release the dog and see which daughter it runs to! Oh well. Minor plot hole. I love the emotion in this movie. The twins switch places so Hallie visits London while Annie visits Napa Valley. When Hallie meets her mom, the melancholy and joy are positively palpable. The mom is clearly happy to see her daughter after several months of summer camp, but the daughter is overcome at finally seeing her mother for the first time that she can remember. Seeing these two characters having two completely different reactions to the same event is priceless. And it only gets better from there. When Chessy learns that she’s been talking to Annie this whole time, she reacts in the most touching and yet funny way. She recalls seeing her as a baby for the first time and she asks to hug her while Annie’s dad is standing there completely confused by what’s going on. She then announces that she’s going to cook everything in the pantry because she has no idea what Annie likes. It’s both a great character moment and a tension release for the audience. When the mom discovers that Hallie isn’t Annie, she also reacts quite well, but it doesn’t have the same power as Chessy’s revelation. Maybe it’s because it’s the second time we’ve seen this revelation or the fact that no one has to keep up any pretenses at this moment. It’s still good, though. Most of the power is gone by the time the dad learns the truth, but that’s also just fine because by then the focus has switched from the daughters to the parents, so we’re more interested in seeing the two of them come back together. Dennis Quaid is simply one of the greatest actors to ever grace the screen. No matter what role he’s playing, he looks like he’s having a heck of a lot of fun. Quaid and the late Natasha Richardson play the twins’ parents who broke up 11 years ago and are now forced back together by their scheming daughters. In the original film, the two characters would wind up fighting every time they shared a scene together. It got quite exasperating after a while. But Quaid and Richardson swing completely in the opposite direction, and they seem to be walking on eggshells whenever they’re together. This is a much more realistic take on the relationship. These two people were madly in love for a short time, and they had one bitter argument and haven’t spoken in more than a decade. But every day they’re reminded of their former love by the sweet child they care for. They certainly wouldn’t be bitter after so many years of loving someone who came into their lives because of their short marriage. It makes more sense that they would feel a sense of sadness and regret about losing each other, but no real motivation to seek each other out. The way they treat each other is subtle and perfect. First, they’re shy, then they’re inquisitive, and then they’re genuinely interested in the other’s wellbeing. They try to strike a balance between affection and coldness, and they both do a great job. In the end, there’s no dramatic speech or chase scene or any cliché like that. There are just two people who desperately need each other but are too scared to say it. The way they get together in the end is both satisfying and believable. It could not be better. The daughters meet in a clever way, and their rivalry isn’t drawn out. The parents live in different continents, highlighting just how far apart they are in every way. All the distracting characters and subplots have been removed so the core story shines through. For example, there’s no mention of boyfriends or anything like that for Hallie or Annie. The film moves at a good pace while also spending ample time in just the right places. The Parent Trap (1998) is a special movie to me. It’s rare to see so much talent and hard work being put into what could easily have been just another dull remake. This film pays homage to the original while carving out its own identity. It definitely deserves a watch because I think you’ll be as pleasantly surprised as I was when I first saw it. All images from The Parent Trap are the copyright of Walt Disney Pictures. This entry was posted in Pleasant Surprises and tagged comedy, disney, drama, films, movie review, movies, relationships, romance. Bookmark the permalink. When I saw Parent Trap (2) I was not so convinced that it could replace Parent Trap (1), because of “sentimental values” more than anything – I wasn’t going to let some new version take away what the old version had created (similar to what you mention about the other remakes). However, having had enough time pass, and too many other things happen in life, that bias is no longer present in my mind. I remember the old PT since I have seen it multiple times, but I do not recall the new PT – mostly because I had decided ahead of time that it wouldn’t match up and I haven’t seen it more than once. However, with your review and the points you make, I think it would be a good family movie to watch, now that I can take on a different perspective in the process and not discount it right up front. Thank you for your insight and for sharing. Since there are sequels to The Parent Trap when it was first done why is there not any sequels to the 1998 version? None that I know of. But yeah, I do remember the Hawaiian sequel to the original Parent Trap.